the dining area of Helena's Hawaii Food restaurant. NEWYORK - A humble little eatery in Kalihi is about to claim one of the most prestigious awards given to American restaurants. Helena's Hawaiian Foods, a 54-year-old institution on North King Street, is one of eight restaurants in the country chosen to receive the James Beard Foundation's Regional Classics Restaurant Award. The awards will be presented tonight in New York City. 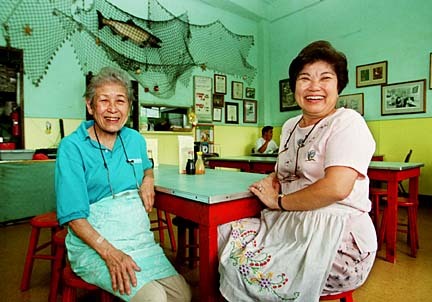 Only three restaurateurs in Hawaii can lay claim to a James Beard Award: Roy Yamaguchi, Alan Wong and now, Helen Chock, the 83-year-old owner, cook, "janitress and dishwater" at Helena's. The whole thing still has Chock overwhelmed. "I said, 'No, with all those big people ... and my small restaurant ... I didn't want to accept, I didn't want to go." But she will attend the awards dinner, representing the tiny restaurant she has run almost single-handedly since the end of World War II. The annual James Beard Awards, often referred to as the Oscars of the food world, go primarily to high-end restaurants and their all-star chefs, such as Yamaguchi and Wong. The Regional Classics awards, however, recognize small, locally owned establishments, one for each of eight parts of the country. Hawaii is included with the Pacific northwest region. The foundation says a Regional Classics winner should be "beloved in its region for quality food that reflects the history and character of its community." Helena's is one of a handful of family-owned restaurants in the state serving a menu of traditional Hawaiian foods. It is a simple place of formica tabletops and wooden stools, but a favorite of many local celebrities. It's been recommended in Zagat's, a national restaurant guide. Chock's specialties are pipikaula-style short ribs and butterfish collars - a section of the fish between the eyeballs and the gills, served fried crisp or in a stew sauce. It was her husband, Jong Chock, who suggested the name Helena's, saying it sounded more Hawaiian than Helen. Chock has worked there 16 hours a day almost since the start, but she's had to cut back recently - "14 hours now," she said. The only other Hawaii name in the James Beard competition this year is Jean-Marie Josselin of A Pacific Cafe, a finalist this year as best chef for the Pacific northwest-Hawaii region. All chef finalists are invited to the awards ceremony, but in the Chock's category there are no finalists, only the eight regional winners. All are invited to attend, although their names are normally kept under wraps until awards night. Chock said she'll attend the formal affair in a long-sleeved, long muumuu and low sandals, "so I don't trip and fall. "You think I should bring some leis?"